These iNFO POINT terminals are designed for public infomation systems, where people utilize an easy access to available information, guidance, product presentation and general browsing to the data sharing system. The interactive iNFO POINT Kiosk terminal consist of a large flat TFT display monitor equipped with a Touch Screen feature and a PC - all integraded into a slim line standing stall. The iNFO POINT data access terminal connects directly to the information network system. When ordering You may choose either the 15.1" XGA flat panel equivalent to a 17" size of the CRT or the 18.1" SXGA resolution panel equivalent to a 20/21" CRT. The Touch Screen device is integrated directly on the front of the TFT display. The system includes the Mouse emulation. 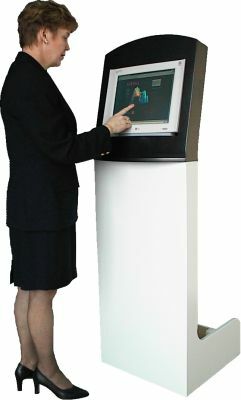 The iNFO POINT Kiosk is always equipped with a PC including necessary features upon the application use. For a simple task we can use a NET-PC without HDD and FDD. The terminal can be networked to Intranet or Internet. It is always assembled upon the capasity requirements. In international environments a multi-lingua service can be realized easily. In addition sound effects are useful with the presentation. Alpha Point supplies iP500 or iP800 Kiosk terminals or it's components to the system integrators and gives comprehensive technical support for the above products to be designed into a customer's total information system.